Animals comprise various mundane creatures that have no magical or weapon-wielding abilities. Statistics for animals except horses are provided on this page; see Horses for all information pertaining to horses. The animals on this page are also all listed in the Oblivion-Creatures-Animals category. The "Animals" category includes a wide variety of creatures, with different degrees of aggressiveness (some have no attack capability at all), and many different habitats. The characteristics common to all animals are that they are modeled upon real animals that exist on earth, and that they rely exclusively upon physical attacks using their bodies (claws, paws, hooves, fangs, horns, etc.). The damage values listed on this page under "Attacks" are all for melee-type damage. Resistance to elements. Many predators have weak (20%) resistance to frost. Diseases. Most animals can be infected by (and can transmit) one or more diseases. Most of the standard animals on this page (specifically, Black Bears, Brown Bears, Boars, Timber Wolves, Mountain Lions, and Wolves) will not attack you if you are wearing the Boots of the Crusader (acquired as part of the Knights of the Nine official plug-in). The leveled lists used for animals are somewhat complex. Unlike other creature classifications, there is no single semi-standard list. Under "Aggressive Animals on Standard Lists" are listed the animals that are most commonly found on the animal lists. "Aggressive Animals on Other Lists" provides other animals that are randomly generated, but appear on a variety of other lists. The remaining animals are generally never aggressive. The details of when and where an animal can be encountered are provided in each animal's specific section. The level provided for each creature in the "Lvl" column is the typical level at which the creature is first encountered. As bosses, creatures will generally be encountered two levels earlier; also, all animals generated along roads can be encountered two levels earlier. All creatures encountered in the exterior of Fort Caractacus will also be encountered two levels earlier. Some creatures' health varies depending upon your level, indicated by an equation in the Health column. The "lvl" used in the equation is your level. The soul for these creatures is usually variable; the souls column indicates the range of soul strengths that are possible. For full details on variable soul strengths see the Souls page. The following table summarizes the standard animal lists that are used to generate random animals in ruins and caves. Animals are often mixed in with a few Monsters, according to the "Mixed" list shown in the table. These leveled lists are only used inside; the lists used to generate animals in the wilderness and along roads are summarized at Outdoors Creatures. See Leveled Lists for details on how these lists are used to determine the probabilities of individual creatures appearing. Boars are never found in ruins or caves. Bears are large, hostile creatures that will attack you if found infringing on their territory, and can typically be found in the wilderness or in caves. They are impressive creatures, much larger than the average adventurer, especially when standing up on their rear feet. Bears also have two main types of attack: biting, or standing up on the rear legs and mauling you with their paws. They are also not terribly fast in speed or agility. All variations of bears have a 20% resistance to frost and also have a 10% chance to transmit the Yellow Tick disease, which reduces both your speed and strength attributes. This is a summary of information on bears. See the main article for more detailed information. Boars are small, relatively slow (speed 12) animals with dangerous tusks. They are encountered starting at level 7. They are the only hostile animal that is not found in ruins or caves. 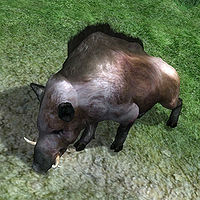 Boars are only found outside, in Plains, Swamps, Forest, and Rainforest regions. They will be found starting at level 5 along roads. A 10% chance of being infected with the disease Chanthrax Blight. If you are wearing the Boots of the Crusader (from the Knights of the Nine official plug-in), normal Boars will no longer attack you. However, all other varieties (e.g., Arena boars) are unaffected by the boots and will attack as usual. Found in the Arena Bloodworks. Fights for the Blue Team (your side) in the final Hero match. (Only with the Thieves Den); the pet of Khafiz, the fence of Dunbarrow Cove. Deer are non-aggressive animals that even when attacked will prefer to flee. Deer are never found in caves and ruins. Outside, they are randomly generated using the same wilderness and roads leveled lists that generate predators. Therefore, deer are encountered when you are lucky and a deer was chosen in place of the enemy that otherwise would have been there. Furthermore, seven deer may be encountered in Mankar Camoran's Paradise. 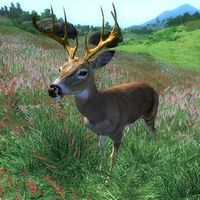 Deer are found starting at level 1 in any type of terrain. When deer appear, there are equal chances of encountering three does, two does, or a single buck. A 10% chance of being infected with the disease Dampworm. Buck that is found in seven Wilderness locations being hunted by an Imperial Legion Forester (respawns). 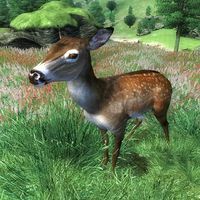 Doe that is found in seven Wilderness locations being hunted by an Imperial Legion Forester (respawns). One of the does is identified in the construction set as "bambi." 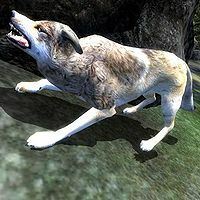 Doe that is found at eighteen locations inside the Bruma Oblivion World, where it is identified as an "Oblivion Siege Target"
Dogs are domesticated animals (in appearance they are nearly identical to wolves); whether or not they are friendly depends upon who owns them. Randomly generated dogs are Bandit or marauder dogs (and in fact are generated in place of a bandit or marauder) that are hostile towards you, although they will not necessarily attack on sight. The other dogs in the game are all pets of townspeople and are friendly (unless you have done something to anger the owner). A 10% chance of being infected with the disease Witbane. Anvil Lighthouse Basement as part of the Dark Brotherhood quest Following a Lead. Not found in the game. This issue has been addressed by the Unofficial Oblivion Patch; the dog is placed at the Knights of the Thorn Headquarters. "A Fighting Chance" in the Imperial City Market District. (The owner of "A Fighting Chance" is Rohssan). Sakeepa's House in Aleswell (initially invisible). Mountain lions are rapid and vicious predators. They are typically encountered at level 12. They are on the standard animal lists for caves and ruins. They are also randomly found outside in Farm, Plain, Rainforest, Highlands, and Mountain regions. They will be found starting at level 10 as boss-level creatures, along roads and in the exterior of Fort Caractacus. Furthermore, you will encounter 6 mountain lions at level 1 during the Fighters Guild quest A Rat Problem. A 10% chance of being infected with the disease Wither. 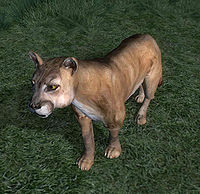 If you are wearing the Boots of the Crusader (from the Knights of the Nine official plug-in), normal Mountain Lions will no longer attack you. However, all other varieties (e.g., invisible ones at Fort Caractacus, Arena lions, and Starving Mountain Lions) are unaffected by the boots and will attack as usual. Arvena Thelas' Basement (first mountain lion encountered). Outside Anvil (four of them exist and all must be killed). Arvena Thelas' Basement (final mountain lion encountered). Mud Crabs are weak nuisance creatures found everywhere near water. 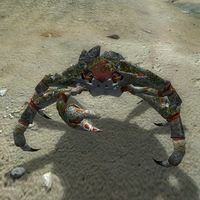 Although larger than many crabs on Nirn, they are smaller than most other animals encountered in Tamriel. They are part of many leveled lists. Outside, they are found in swampy areas, along coastlines, and in shallow water. In caves and ruins, they are found in "Wet Lairs": in just about any area with water, Mud Crabs can be randomly generated in place of the enemy that would normally be there. Mud Crabs are also very common in sewers. A 15% chance of being infected with the disease Swamp Fever. 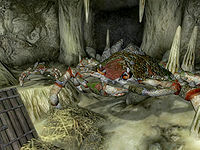 There is one giant Mud Crab in Greenmead Cave. It is really just a standard Mud Crab, but its scale has been set to 3 (instead of 1). Mankar Camoran's Paradise. Although the crab carries a weapon, it does not fight with it. Rats are the second type of weak nuisance creature that can be found nearly everywhere. As with Mud Crabs, they are oversized compared to many rats on earth, but are still relatively small compared to Tamriel animals. Outside, they are found in Farm, Valley, Forest, and Rainforest terrains. 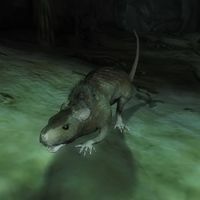 In caves and ruins, they are found in "Dry Lairs": in just about any area in Tamriel (but not in planes of Oblivion), Rats can be randomly generated in place of the enemy that would normally be there. Rats are also very common in sewers and in goblin lairs (where they are farmed for their rat meat). A 25% chance of being infected with any one of seven diseases: Blood lung, Bone Break Fever, BrainRot, Feeble Limb, Red Rage, Shakes, or Witless Pox. Only appears in a leveled list to do with the Arena, but the list is never used. Can be found in the Imperial Prison Sewer. It will not attack you unless attacked first. Two Tunnel Rats may be summoned by Llevana Nedaren during the Corruption and Conscience quest (depending upon which method is chosen to complete the quest). Found slowly ambling around the Cheydinhal Dark Brotherhood Sanctuary. This rat is a member of the Dark Brotherhood; killing him will get you expelled. However, as he is presumably considered too nonthreatening by Lucien Lachance to warrant assassination along with the rest of the Sanctuary residents, it is not necessary to kill Schemer to complete The Purification quest. 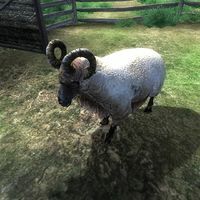 Sheep are the least aggressive animals in Tamriel; many do not even have the ability to fight back if attacked. Sheep are all found in farms and sheepfolds. The only randomly generated sheep in the game are those spawned by Wabbajack. There is a leveled list specifically to generate sheep, but it is never used; the standard sheep are only found at Shardrock. A 10% chance of being infected with the disease Droops. Striking a sheep is illegal and will give you a bounty of 0.5 gold if you are in line of sight while the sheep is being attacked, regardless of whether you are the person attacking the sheep. 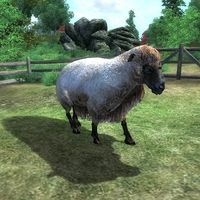 One of the sheep at Weynon Priory and the ones owned by Uuras the Shepherd outside Skingrad have a liking for apples and will follow anybody who has one. Sakeepa's sheep in Aleswell (initially invisible). Sakeepa's ram in Aleswell (initially invisible). 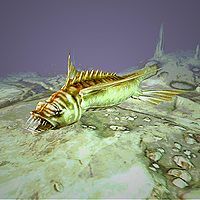 Slaughterfish are the only fully aquatic animal in the game, and therefore are the sole inhabitant of deep waters around Tamriel. They are found around Lake Rumare (the northwest part of the lake has Rumare Slaughterfish; the rest of the lake has regular slaughterfish). They are also found in various submerged parts of caves and ruins. On rare occasions, Slaughterfish have been found out of water; bouncing and flailing around on dry land. Up to sixteen can be found in Mankar Camoran's Paradise. Rumare Slaughterfish (but not regular Slaughterfish) have 50% Weakness to Shock. A 10% chance of being infected with the disease Greenspore. Unlike slaughterfish of Morrowind, Oblivion slaughterfish are usually pretty rare, whereas Morrowind slaughterfish appeared all the time in waters. See Wolves for general information. Wolves are fast and tenacious opponents. Regular Wolves are encountered starting at level 1; at level 6, Timber Wolves start to appear. 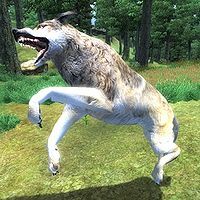 Both types of wolves are common throughout Tamriel: they can be randomly generated in all types of terrain except Swamp and Rainforest. They are also found in caves and mines as part of standard animal and mixed leveled lists; they are also common in vampire lairs. Wolves in "Beast" leveled lists start to appear at level 2. 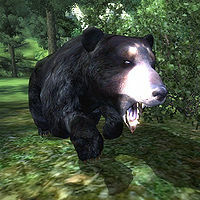 Timber wolves start to appear at level 4 in Vampire dungeons, on roads and in the exterior of Fort Caractacus. A 10% chance of being infected with the disease Helljoint. If you are wearing the Boots of the Crusader (from the Knights of the Nine official plug-in), normal Wolves and Timber Wolves will no longer attack you. However, all other varieties (e.g., invisible ones at Fort Caractacus and Arena wolves) are unaffected by the boots and will attack as usual. Havilstein Hoar-Blood's pet wolf; encountered on Gnoll Mountain during the Dark Brotherhood quest The Coldest Sleep. (Only with Fighter's Stronghold) - the pet of Niels, the smith of Battlehorn Castle. Hjalti seems to be a dog/wolf crossbreed; the appearance is wolf-like but the stats are dog-like. These creatures are all already dead, and are mainly of interest because of the possibility of finding loot on some of their corpses. These creatures are listed in the construction set but are never found in-game. Template for deer that appear in Paradise; provides default behavior. Part of an unused "ArenaMonsters1" leveled list. 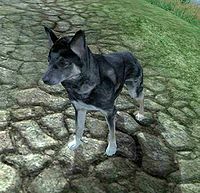 Almost Identical to the dog named Charlotte used in game, this version is in the Mages Guild and Imperial City Factions. Probably intended to be part of the Cheydinhal Fighters Guild, and is a member of the Fighters Guild Faction. Probably intended to be placed in the Knights of the Thorn Lodge, and is a member of the Knights of the Thorn Faction. Probably intended to be in the Blackwood Company Guild in Leyawiin, although this version is not a member the Blackwood Company Faction. Probably intended to be in the Blackwood Company Guild in Leyawiin, this version is a member of the Blackwood Company Faction. Template for all creatures created by Wabbajack; provides default behavior. Template for all creatures created by Sanguine Rose; provides default behavior. This page was last modified on 22 November 2018, at 03:39.